I was venturing blind into new territory here. I was not familiar with author Keith Donohue and I was not sure what genre of story this was going to be, though I suspected (by the cover, mostly) it would be dark fantasy/horror. But it’s more than that, and not that at all. It’s a sad, mysterious romance against a darkly magical backdrop. Kay and Theo are newlyweds who have just moved to Quebec. Theo is a translator, currently translating the life story of photographer Eadward Muybridge. Kay had been an acrobat, in Quebec, and shortly after moving back, she visits the old theatre where she once worked. But one night she does not return home. Leaving the theatre she was followed and she ducked into the Quatre Mains … a toy shop that never appears to be open. There she is taken by the shop owner and turned in to a puppet. Theo is beside himself with worry for his bride and scours the city looking for her, checking the most obvious place – the theatre – first. Without much luck, Theo goes to the local police to report Kay missing. Theo, of course, is the prime suspect in Kay’s disappearance. While Theo loses himself with fear and longing for Kay, Kay loses herself in the world of the puppets. She has identified herself as one of the many puppets. She has a faint memory of her life before, but she doesn’t long for it. All of the puppets have a sad complacency about them, setting a troubled undercurrent of mood about the book. I enjoyed Donohue’s writing. He has a remarkable knack for mood and tone. He can place the reader into a location and give us a real sense of what everyone is feeling. And this is what kept me going. I could feel Theo’s sense of urgency and his losing control, and I could feel Kay’s confused complacency. But what I couldn’t feel was a purpose. I stayed with the book because of the language, hoping it would take me somewhere, and I enjoyed the journey, but when it was done, I was left unsatisfied. I will definitely be curious to read some of Donohue’s other works and hope that, instead of retelling an old story (you’ll see many other reviews refer to this as a retelling of the Orpheus and Eurydice myth), he’ll give us something completely new. Looking for a good book? 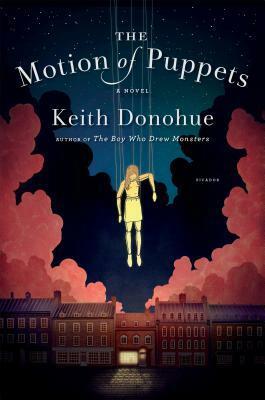 The Motion of Puppets by Keith Donohue is a mesmerizing story – a retelling of the Orpheus and Eurydice myth – that doesn’t quite satisfy.